Posted on January 15, 2014 by J.
I’m probably going to be unpopular for saying this. I am the first to say that there are exceptions to the generalizations that I’m going to make, but I believe that what I am about to argue is true far more often than it is not. I’m not, incidentally, trying to be critical of any actor on the planet in saying what follows. On the contrary, I am in complete sympathy with them, but that doesn’t change the reality, I don’t think. As some of you know, in addition to acting, I teach people to play golf, and I see a lot of analogies between the two. So here’s why you aren’t going to learn much about acting if all you do is act in productions in which you are cast. First, because you can’t see what you’re doing. So you think what you’re doing is working. And because you’re assuming that it is working, you keep doing it. Keep doing it, and you might be getting really good at something that doesn’t work. I’ve had golfers tell me that “they aren’t good enough to come for lessons yet.” But by the time they get “good enough”, they have grooved some substantial swing errors so well that to undo them without spending a lot of time on the driving range is nigh to impossible. It’s easier to correct your misconceptions as an actor, but it still takes “range work”. Second, because you think what you’re doing is the right thing to do. This is slightly different than the first reason. The first one is sometimes the product of flying by the seat of your pants. You’re new to this acting thing, so you get up on stage, you say your lines, your friends and family come to the show and tell you how wonderful you were. Ergo, it must be working. So I’ll do more of same the next time! No, the second reason is based on you making some intentional choices about what you are doing. This typically happens after you’ve done a show or two, and you have now reached some conclusions as to what this acting thing is about. Or you are relying on some pretty common assumptions about what acting demands. Most people operate on faulty assumptions, and don’t realize why following them is going to lead them down a dead end. Someone else has to point out the flaw in the argument, and you typically won’t find that person at rehearsals. There are a number of ideas about both golf and acting that I think are “myths”. That is, they are commonly believed by many people who are still learning to play golf or act, but they are incorrect. Because so many people repeat them often in friendly conversation, however, they take on credibility simply through repetition. (See this post on Myths.) If they weren’t true, so many people wouldn’t be in agreement, would they? Also in this group are perfectly correct phrases about what to do that people completely misunderstand and so do incorrectly, while being sure they are doing it the correct way! Third, because you won’t believe that what you’re doing isn’t working until someone can give you a moment where you do it in a way that does work. Only then can you see the difference between “good” and “better”. Otherwise, “good” seems great. But put it next to “better”, and “good” starts to look pretty inadequate. This is much easier to do on the golf course, where the ball flight immediately tells you what works and what doesn’t, than it is on stage. An acting teacher can give you that experience, but it takes more time than regular rehearsals permit. Fourth, because most directors aren’t capable of helping you be a better actor. This doesn’t mean they are bad directors. They might be very good directors. But believe it or not, helping all of the actors in a play to give the best performance they can is really not the number one priority for most directors. This doesn’t mean they aren’t interested in doing so, but they have a number of responsibilities. Helping the actors act is only one of them. But even if they had all the time in the world to devote to your personal performance, most directors aren’t going to be able to help you become better at your craft. A few of them might be able to help you give a better performance in their play, but most directors aren’t acting teachers. Even if they are, the short time frame of a rehearsal period doesn’t permit the transfer of technique in a way that you can easily carry to the next play you’re in. You might learn a thing or two that will stay with you for the rest of your life, but whatever you learn will be a fraction of what you’d learn in another setting. And lastly, because you have a deadline. And that’s scary. You have an opening night looming in front of you, and you will do what golfers do when they try to go out and practice while playing their usual Sunday round. They hit a bad shot or two, which is what happens when you’re trying to change how you do something, and they panic. They have a bet on the line, and a responsibility to their partner in that bet. And so they go with the tried and true. At least if they lose, they figure, they are dancing with the devil they know. Fearing that spending time in rehearsals experimenting with your technique may result in your not being ready on opening night, you’ll revert to what is comfortable so as to not risk letting down the rest of your cast. Or embarrassing yourself on opening night. I don’t want to minimize the usefulness of watching actors who know what they’re doing do their stuff. On the contrary, watching them in the context of an acting class, when you can hear the discussion between them and the teacher, can be enormously helpful. Even watching them in rehearsals when you’re cast in a play with them can be helpful. But it is difficult to know how they are going about what they’re doing. You’re apt to identify the symptoms — what it looks like — rather than the root cause of how they get there — what their process is all about. I watched the promotional show for the film August: Osage County the other day. 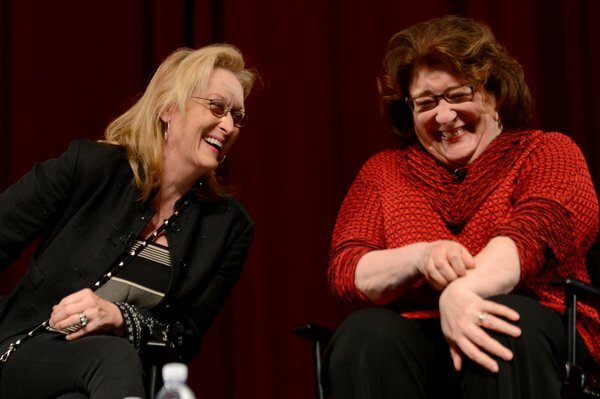 Margo Martindale, an actress with an Emmy award and a variety of other award nominations, said that she would give anything to know how Streep prepares before she gets to the set. If an actress with a 30+ year successful career in theater, film, and television isn’t sure how Streep works, it probably isn’t all that likely that you’ll learn everything you need to know just by watching those who do. Just sayin’. I was working with an actor of some experience and talent last week who said to me, “Acting is a lot harder than I realized.” Yes, it is, but largely that’s a function of our misconceptions about how to go about it and the difficulty of getting good feedback about what we are doing (absent accurate feedback, we have to find people who know what they’re talking about and whose opinions we trust). Change your misconceptions – that is, replace the myths with a process that works – and get good feedback through a teacher, and you’ll find your acting chops will grow by leaps and bounds.